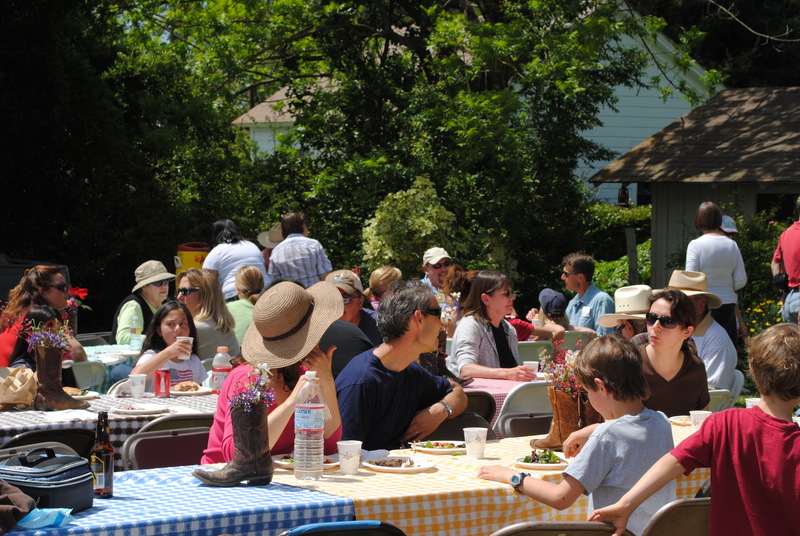 We hosted our Annual Field Day yesterday, a sunny, fun-filled day that I look forward to every year. We invite all of our customers (and anyone else who wants to join us) to come out to the ranch. Our customers get to meet the Morris Grassfed team, if they haven’t already, and we get to put faces to the names we have seen on e-mails and heard on the phone all year. The importance of this day is the relationships that are built. As a local food producer, it is essential that we capture the close connections we have with our customers. It’s our market advantage. And it’s unique. I call it “First-Person Certified.” Our customers are able to see the land where their beef is born and raised. Their children can touch and smell the grass. They ask great questions – as one did yesterday – about how old the cattle are before they die and how they are processed and handled. These things are as important to our customers as they are to us, and we want to share that knowledge. I spoke to one customer, concerned about how the animals are treated, for a half hour. I assured her that we carefully choose the facilities where the animals are processed. We accompany each load and make sure they are using low-stress handling techniques developed by Temple Grandin (www.grandin.com) and established Hazard Analysis Critical Control Points (HACCP) programs. We have agreements with each of our slaughterhouses that they follow our strict guidelines and we monitor it regularly. And then I told her to feel free to call these facilities directly if she wanted to hear it from them, first person. Our customers are our certified verification auditors. If they see something they don’t like (which we haven’t experienced) they won’t buy from us. It’s about as rigorous an audit as a company can have. When I used the term “First-Person Certified” yesterday, one person told me I should copyright it so others won’t use it. As I thought about it later, the term protects its own integrity by its very meaning: if you’re not dealing with your customers directly, then you’re not first-person certified. And your customers will know this. One woman told me that on our delivery day she arrived to meet our truck and was surprised to see Joe, delivering the meat himself. “I didn’t expect that you guys would be the ones actually delivering the beef!” she said in amazement. That’s first-person certified. We answer our own phone (or call back if we’re not in the office), we raise our own cattle, we choose our own processing facilities (and we’re picky), we are accountable for the quality of our product from its conception to delivery. I think that is what differentiates the local food movement from others: we are first-person. We don’t need a third party, national or international certification to prove what we do. It’s an advantage that is only available to companies that make a conscious choice to nurture those crucial relationships. Our economy of scale applies to filling up the delivery truck to maximize the fuel and time costs of delivery. The other point I want to make about certification is the goal. If the goal is to know more about how the product is produced, certification does that. Third party certification is valuable if you don’t know the producer. National standards help ensure that claims are backed up with third party audits and regular monitoring. This is important when you are purchasing a product with a claim on it from someone you’ve never met or do not know. We know our customers and they know us. We also know our butchers and others who touch our product along the way. Every day, we are meeting our customers’ – all 800 of them – established sets of standards. Note how I use the plural with “standards.” One customer may want to ensure that our animals are treated humanely. Another may be looking for beef free of nontherapeutic antibiotics or artificial, growth hormones. A third, may want to only buy beef that is contributing to healthy soils and watersheds, and therefore wants to support a ranch that uses rotational grazing to promote perennial grasses. A fourth customer may want all of the above. Each relationship is different, and each is important. If the goal of certification is to ensure that your product is meeting an established set of standards, then we are indeed first-person certified. If you don’t know the goal, it’s hard to set a standard. 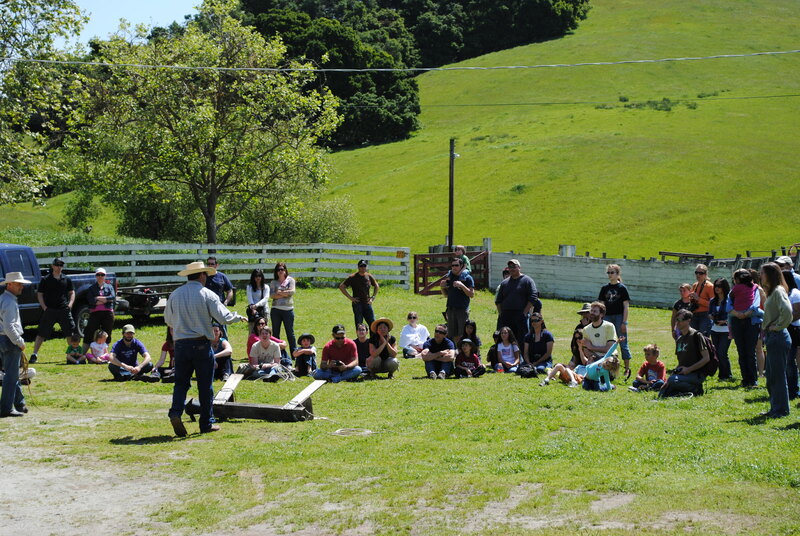 Building customer relationships at the Circle P Ranch in Watsonville, Calif. April 17, 2010. For example, for beef to be certified organic under the National Organic Program (NOP), a cow must have “access to pasture.” According to the NOP’s definition, this means an animal must be on pasture for “the majority of their lives,” typically 12-18 months, and then fed a grain based diet, confined in a feedlot, for approximately four to six months. This standard would not meet our own standards. Nor would it meet many of our customers’ expectations of how they want their beef raised. Our cattle are never put into feedlots. They are born, raised and finished on open grasslands. We have opted not to go through the time and expense of filling out binders of paperwork and spending thousands of dollars to achieve a certification that 1.) does not meet our customers’ standards, 2.) is less rigorous than our own standards, and 3.) would most likely raise the price of our product. A third-party, national certification is meaningless if your standards are not being met. A food producer can’t pay to be first-person certified. You either are or you aren’t. It’s up to your customers to decide – they are the auditors and if you don’t pass the inspection, you’ve just lost that sale. To put time and effort into a certification that does not meet your goals is the equivalent of taking French lessons to prepare for a trip to Italy. French may be beautiful, but it’s not going to help you order Bistecca alla fiorentina.